Accommodates 20, 30, 40 or 50 people! We have 2 large side by side cabins with amazing lake and mountain views! Rent the "Blue House" for up to 30 people. Rent "Blue" and "Yellow" houses for groups of 30-50 people. We still have many weekends and full weeks available. Check our Availability Calender, then Contact us! Top 10 Reasons Big Bear Lake Group Outings stay at Big Bear Hostel Lodge! Gas BBQ and Picnic Tables! Big Bear Visitor Center, Bars, Shopping, Ice Cream and more! 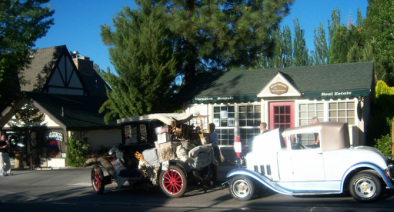 Antique car shows and other weekly events take place in the village! Free Friday Night outdoor entertainment in Summer. from our backyard BBQ meeting area! We are your Ski and Snowboard Trip Group Base Camp! We are located in downtown Big Bear. Just 1 mile from Snow Summit and 2 miles from Bear Mountain. 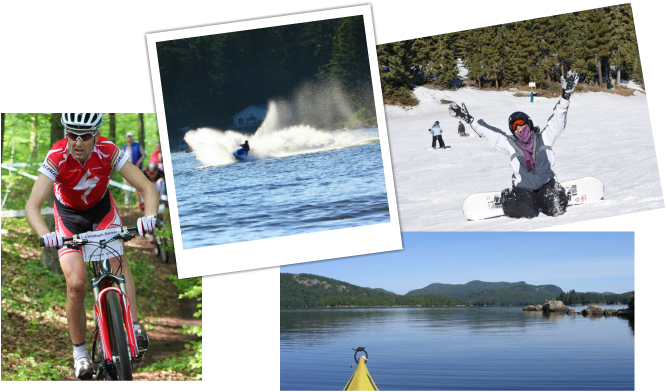 Big Bear Hostel' s Group Cabin Rentals are the best location for groups of all kinds to enjoy winter fun. You can build snow men, go sledding, go snowshoeing, ski, snowboard, shop, karaoke, and party the night away within a few blocks. Whatever the activities you enjoy by day, our location let's you walk to nightlife and restaurants for the perfect end to a perfect day! We have a vinyl playground right next to the deck. Free HIGH SPEED WIFI INTERNET everywhere! Our Blue House has Cable TV 90+ channels in living room and most bedrooms. Ping Pong and Foosball in house! 4 pool tables, shuffleboard, video games. Fishing and Jet Boat Tours across the street! Great Big Bear Hiking Trails at the end of our street! you are at a vantage point overlooking the entire valley! for all the hiking and biking trails in the area. and you can hike down or bike down. 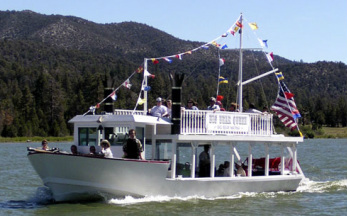 More reasons Big Bear Lake Group Outings stay with us! Awesome Lake and Mountain Views from our 40 foot Redwood Party Deck with Gas BBQ! Walk 1 block to Lake, Parks, Restaurants, Movies, Bowling, Bars, Shopping, Ice Cream and more! Our 2 houses feel like your home away from home! Free High Speed WIFI everywhere and Cable TV in most Blue House rooms. Hiking: Your group can walk up our street and into the forest to a fantastic lake view vantage point in 30 minutes! Kitchens: Each house has fully stocked kitchen with stoves/ovens/microwaves/dishwashers/pots/pans/utensils! No hidden surprise charges for your rental. Average temps are in the 60's to 80's May to October. Perfect Weather! Rent both houses and you have a huge private lodge all to yourselves! No sharing with other groups! Family Reunions with kids under 12 enjoy our splinter free backyard playground. We look forward to hosting your special event and continually improve our facility so that it has everything your group outing requires! Pricing is only given by email after you fill out our group contact form. Please contact us for a price quote and detailed information!